Gilford’s Historical Society is once again offering rug braiding “bees” on the third Saturday of January, February, and March, from 10-12 at the Grange building next to the Library in Gilford Village to all those who are interested. 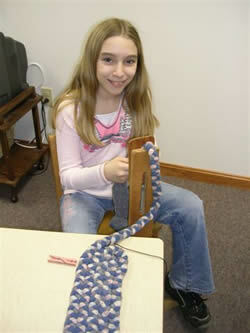 Ten-year-old Danielle Maupin (shown in picture) will be attending with her mother. Danielle started her rug last year when she was in the third grade; she loves to braid but although she has tried lacing the braids together she is happiest when her mother, Sue, does the lacing for her. When she was asked where she planned to put the finished rug, she replied, “I plan to put it downstairs by the fireplace so the whole family can enjoy it.” Danielle enjoyed braiding last winter but put it aside once the weather warmed and she could spend more time outside horseback riding. Her mother feels that creating a rug together is a good mother-daughter activity. Last year we also had a mother and her elementary age son who came and started a rug. He was very patriotic and picked out red, white and blue as the colors for his rug. So mothers, if you are wondering about an activity you and your child can share during the winter months, you might want to consider braiding a rug. Cindy Anderson of Gilford is a multi-talented craftsperson who loves to hook rugs. When she was asked why she has been attending the braiding “bees” for the past few years, she replied, “I come because it motivates me to continue and to finish this rug project.” She is hoping to finish a rug that her mother started “forever ago”. It had been in some of her mother’s boxes stored in the attic for at least 25 years, along with the strips of precut wool. She admitted that she had not worked on the rug since our last “bee” but hopes to finish it some day. Lesley Robie is the mother of a young child who came last year because she was interested in “reviving an old skill”. She started a rug last year; we will be interested in seeing her progress this year. This will be the fourth year that Marion Ekholm and Kathy Lacroix will be upstairs at the Grange Building to encourage and help those who are interested in braiding a rug. The “bees” first started in September of 2004 when Jan Jurta of the Country Braid House in Tilton very kindly presented a workshop for the Historical Society on braiding and lacing. Since there was such a large gathering of people (26) who were interested, it was decided to offer rug braiding “bees” during the winter months. Some come to learn how to braid and others to share, get new ideas, and stay motivated. Marion and Kathy do not claim to be master rug braiders; they both enjoy braiding and are willing to share their knowledge with others. Gilford’s Historical Society is pleased to offer these free “bees” to anyone who is interested. We all get ideas from one another. If you have a finished rug that you have braided, we would love to have you bring it and share it with us; it might give someone an idea how to arrange colors for their braids. If you have never tried your hand at braiding, come and see what we are doing, if you are then interested, you can join us the next month. You may want to buy new wool, or you may have some stored away in a box that you want to use. You may have started a rug years ago, put it away, and now want to finish it. Or you may have a rug that your mother or grandmother started that you now want to finish. We hope to encourage the feel of the old-time “bees”, where friends gathered to work together, share ideas, and have an enjoyable time. The “bees” will be held at the Grange the third Saturday of January, February, and March, from 10-12. However, if the weather is snowy or sleeting, the “bee” will be held the following Saturday. If there are any questions, call Kathy at 524-3390.